The opportunity for students to take a subject exam provided by the College Board each May; qualifying AP® exam scores enable students to earn credit or advanced placement at many colleges. How does a course qualify to be called “AP®”? Before an AP® course is offered by a school, it must go through—and pass—a course audit. When you see “AP®” in a course’s name, you know that the course conforms to a college-level curriculum standard. 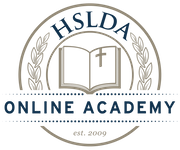 All HSLDA Online Academy courses pass the AP® course audit before they are taught to students. Most students who take AP® courses are juniors and seniors in high school. However, younger students can also take a course, if they are ready. Individuals older than 18 can take AP® courses—including adults. If you want to learn more about what it takes to be ready for AP® studies, go here. To check out course information and see if your student is ready to take a specific course, you can find more details on our course listing page. If, after reading a course description, you still have questions regarding course content and your student’s readiness, simply call us at 540-338-8290 and we’ll get you what you need to decide well. How can AP® high school courses help my student succeed in college? AP® studies can give you a head start on your college degree. Many colleges give students credit toward graduation on the basis of high AP® exam scores, or allow them to place out of lower-level classes. AP® courses give you a preview of what college will be like. AP®-level work helps students learn essential college study skills. For students with AP® experience, the challenges of rigorous college courses will be much more familiar and manageable. Which colleges and universities accept AP® exam scores? Specific college admissions offices can tell you their policies regarding AP® score acceptance. We recommend that you go to the website of the college or university you are interested in, or call its admissions office, for specific details. look up transfer credit policies for individual colleges. How does the scoring of the exams work? Final AP® scores range from 1 (low) to 5 (high). To read about how AP® exams are scored, go here. You can also find information about AP® exams and scoring in our score results reports. Why should my student take an AP® course? AP® courses have many benefits for you and your student. Click here to read The Top 10 Reasons Your Teen Needs to Take an AP® Course.